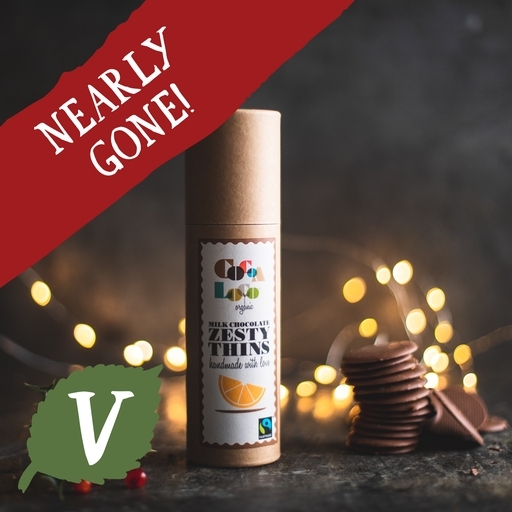 We love these delicate organic chocolate thins with a touch of warming orange. They’re handmade by artisanal British chocolatiers Cocoa Loco with rich, velvety smooth milk chocolate and a festive splash of orange oil. Especially good as an after-dinner treat with a steaming cup of coffee. Keep in a cool, dry place, out of direct sunlight. Cocoa Loco is a small artisan chocolate company operating from their ‘Chocolate Barn’ in the heart of West Sussex. Their award-winning chocolates are Fairtrade, organic, and handmade in small batches by expert chocolatiers. We’re fans. Milk chocolate (cocoa solids (37%), milk solids (21%) (sugar, cocoa butter, whole milk powder, cocoa mass, vanilla powder)), orange oil. May contain traces of milk and soya. Prepared in a kitchen where eggs, nuts, oats, sesame and wheat are also handled.